1762-1801. Born on 20 November 1762 at Mount Ephraim near Faversham in Kent, he came from modest origins, being the second son of Captain Etienne, anglicised to Stephen, Riou of the Grenadier Guards, and of his wife Dorothy Dawson. Riou’s initial service was from the age of twelve aboard the Barfleur 98, Captain Edward Vernon, the flagship of Admiral Sir Thomas Pye at Portsmouth, and subsequently that of Vice-Admiral Sir James Douglas, from which he transferred in the spring of 1776 to the Romney 50, Captain Elliott Salter, flagship of Vice-Admiral John Montagu, the commander-in-chief designate at Newfoundland. It is unlikely that Riou went out to Newfoundland however, for in the early summer of 1776 he joined the Discovery, Captain Charles Clerke, which sailed for the Pacific with Captain James Cook, to whose ship, the Resolution, Riou transferred as a midshipman after Cook’s death. A humorous story later emerged that during the voyage Riou’s vicious pet dog was court-martialled, sentenced to death and eaten by the hungry midshipmen’s mess who had become disillusioned by its frequent assaults upon them. After returning to England in October 1780 Riou was commissioned lieutenant on 28 October and joined the Scourge 16, Commander Chichester Fortescue, going out to the Leeward Islands before returning to the Channel in the following year, from where he left that vessel to enter Haslar Hospital at Gosport on 3 February 1782. Following the peace he was employed aboard the Portsmouth guardship Ganges 74, Captain Sir Roger Curtis, from April 1783 until June 1784, before going out to Newfoundland on the Salisbury 50, Captain Erasmus Gower, flying the broad pennant of Commodore John Elliott in March 1786. After six months unemployment Riou was appointed to command the newly commissioned Guardian 44 en-flute in April 1789, and was despatched to the embryonic colony of New South Wales with machinery, plants, stores, cattle and convicts four months later. On 24 December the Guardian struck an iceberg in a position of 44S 41E after Riou had closed in to obtain fresh water, and it soon became obvious that the ship was in a perilous state of repair. Riou despatched as many people as he could in the boats to the Cape, which was then four hundred leagues distant, and with the assistance of the boatswain, carpenter and a midshipman he battled to save the ship against the elements. Incredibly the Guardian eventually reached the Cape on 21 February 1790, where she was later ran on shore, being considered little more than a wreck. As the rescued midshipman was Hon. 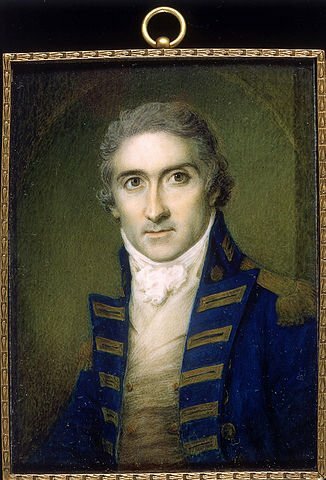 Thomas Pitt, a nephew of the first lord of the Admiralty, it was little surprise that after arriving home to a hero’s welcome Riou was promoted commander with effect from the day of his arrival at the Cape, and following an audience with the King he was quickly posted captain on 4 June 1791. In June 1793 he was appointed to recommission the frigate Rose 28, serving in Vice-Admiral Sir John Jervis’ campaign in the Leeward Islands from January 1794, and leading the boats with Captain Edmund Nugent during Captain Robert Faulknor’s remarkable attack on Fort Louis on 20 March. He removed to the Beaulieu 40 on 25 March in succession to Captain John Salisbury, who later died in August, and in which frigate he took the privateer Vengeur 10 on 18 February 1795 prior to carrying her into Barbados. In May he chased a French ship carrying military stores aground under the batteries at Cap François, and with the support of the Quebec 32, Captain James Carpenter, engaged both to such effect that the ship took fire. His service in the Leeward Islands came to an end in August when he was invalided home. Unusually for a junior captain, but in order to earn a living whilst recovering his health, Riou was given command of the yacht Princess Augusta in the Thames after returning to England. During 1797 he sat on the court martials into the Nore mutineers, which insurrection had broken out on 27 May, and his yacht later joined the entourage of vessels that attended the King in celebrating the British victory at the Battle of Camperdown. Riou returned to a more active service when he commissioned the brand new Amazon 38 at Woolwich in July 1799, taking the French privateer Bougainville 18 from St. Malo on 14 February 1800 off southern Ireland. Unfortunately, the prize was lost the next day when she ran aboard her captor in a storm and sank. After escorting the West India bound fleet out in April the Amazon cruised successfully off Madeira before returning to Portsmouth in July. In 1801 the Amazon sailed with the expedition to the Baltic, and during the night before the Battle of Copenhagen on 2 April Riou worked on the plan of attack with Vice-Admiral Lord Nelson, who had taken an instant liking to him, and Captain Thomas Foley. He subsequently commanded the smaller vessels against the Trekroner Battery during the battle itself, but after receiving a splinter wound to the head he was cut in two by a ball as he sat on a gun-carriage in the act of encouraging his men, and in responding to Admiral Sir Hyde Parker’s signal of recall. The casualties aboard his command during the battle amounted to fourteen men killed and twenty-three wounded, and the Amazon was eventually extricated to safety by Lieutenant John Quillam. A monument to Riou’s memory, and to that of Captain James Robert Mosse who was also killed at the Battle of Copenhagen, was erected in the crypt of St. Paul’s Cathedral. A single man, the address in his will was given as St. Marylebone, Middlesex. Chivalrous and with a keen sense of duty, Riou allowed the Danish seamen aboard his frigate to leave the ship before the Battle of Copenhagen. He was renowned for running a smart, clean, well-disciplined and well-handled ship and was apparently popular with his men over whom he had a commanding presence, even though he was described as reserved and overly modest. One seaman later recorded that his code of discipline was ‘brutal’ however. His voyage to safety aboard the Guardian earned him the respect and admiration of his fellow officers and established his reputation. He was a decent man, devout, and a perfect officer who would have made it to the top without the influence he was extended by the Pitts, and in his early days through Lady Elizabeth Townshend, the wife of Viscount Sydney, the home secretary in Pitt’s government. Nelson said of him ‘In poor dear Riou the country has sustained an irreparable loss’. He was a Fellow of the Royal Society. Contemporaries described him as having a pleasing gloom over a manly countenance, with intelligent, frank eyes.